While we rarely stop to think about it, engineering benefits us every single day, and the field is growing faster than you can imagine! It's easy to think that STEM (Science, Technology, Engineering, and Maths) are only used in super-technical professions, but the truth is that STEM weaves it's way into all of our lives. When children begin to realize how STEM is wound into their everyday life, science no longer just becomes something that is to be learned in a textbook. Kids begin to take an interest in developing skills that will make a STEM career a possibility for them one day. A huge part of stem is understanding the "how" behind everyday products. For example, when we think about phones, we know the basics - a signal is sent to a satellite, and that satellite transfers our messages. When we begin to dig deeper, what device in the phone sends the messages? How does it translate text, pictures, and video into an invisible signal? How can we be sure that the message won't become scrambled, or arrive at the wrong destination? We truly begin thinking like engineers. The natural inquisitive nature of a child makes them perfect candidates for questioning the every day and looking for explanations behind daily conveniences that we take for granted. We recently came across a remarkable young lady called Ann Makosinski. Just 19 years old, Ann is one of the world’s most exciting inventors having already earned fame for inventions such as the Hollow Flashlight, utilizes the thermoelectric effect to convert radiant body heat into electricity to power an LED bulb without the need for batteries or kinetic energy. Ann invented this back in 2013 when just 15 years of age. 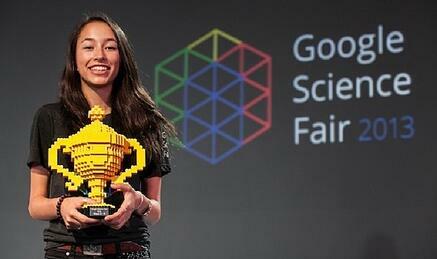 This invention also earned her a number of science awards including at the Google Science Fair. One of Ann’s latest inventions is the e-Drink, which utilizes thermoelectric generators to convert wasted heat from hot drinks to produce electricity. A USB-port can be accessed to charge portable electronic devices. The device can provide a maximum boost of 0.36 Wh, which can extend an iPhone's battery life by 10 to 30 minutes. Ann’s passion for inventing started at a very young age supported by her family and the educators around her. Today, she’s known throughout the world and was named by Forbes in a recent 30 Under 30 list of people who may change the world. When it comes to learning to think like an engineer, it's never too early to start. Engineering classes are a fantastic addition to a traditional curriculum at any age. At STEM for Kids, we encourage children from the age of 5 to enroll in our engineering classes so that any intrigue or interest within these subjects can be nurtured with the support of our team. This summer, enroll your child in our STEM Summer Camps in Dubai. Your little scientist will begin to grow, question, and think in ways you have never dreamed. Watch your child grow into an engineer this summer. The curiosity they develop will benefit them in all subject areas as they prepare to enter the 2017-2018 academic year.